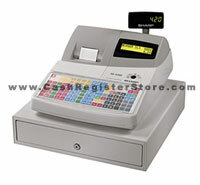 Sharp XE-A302 Electronic Cash Registers at Cash Register Store. The Sharp XE-A302 is truly a full featured cash register at a lower model cost. Some excelling features include 99 departments, 1800 PLU's, and 25 Clerks. The Sharp XE-A302 is our lowest cost cash register with a full flat spill resistant 82 PLU keyboard. To assist you in maintaining a high speed check out environment, an alpha-character, single station thermal printer is standard with the XE-A302. Make viewing your transactions easy with a high contrast 2 line LCD display, and a rotary customer display benefits the customer for easy viewing. A full size cash drawer with a removable till and a subdrawer for holding large bills and checks will aid in allowing more freedom of monetary storage. Another powerful tool the Sharp XE-A302 takes advantage of is its ability to interface with a PC for EASY programming and polling of reports. The programming software feature is a definite must for novice programmers. This software will allow you to upload your end of day sales data to your PC for organized report viewing. This software is designed for ONLY ONE cash register and will NOT connect multiple cash registers for polling of reports. This programming software accelerates cash register setup to get you doing what you need to do...running your business.